Have you ever experienced a tragedy that shook the foundations of your private world? Have you been a victim of someone else's greed and injustice? Have you faced the inevitable losses and disabilities of old age? Have you ever disappointed yourself and others by your blundering? Have you ever given in to temptation and then had to face the fact of your moral failure? Loss is a part of life. There are times when we all have to go back to square one and start over again. 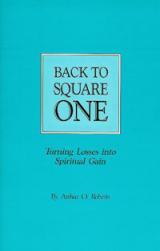 With beauty and insight, Quaker poet and philosopher Arthur Roberts encourages us to turn our losses into spiritual gain.